“Again, Michael Franks switches gears, this time back to a more romantic, thoughtful approach. The result is Objects of Desire, a natural follow-up to Tiger in the Rain. Steve Khan adds a distinctive touch with his guitar work as does Rob Mounsey with his keyboards; yet neither takes away from the orchestrated grandeur of some tracks. Primarily produced by Franks, the album was his most personal statement musically up to that point. Franks forged a distinct impression upon his listeners, even those like me who latched on late, with his Julie London-like vocal work and mellow but clever lyrics. Accompanied by some of the best jazz fusion instrumentalists the era had to offer, the appeal resonated with the genre’s enthusiasts. What can I say? We were legion…and still are. Exemplified by the disc’s Tahitian Moon track1 that still holds me fast, it brought the eye back to Object of Desire‘s distinctive cover art. Loads of album designers, as noted, have retasked well-known photographs (see examples 1, 2, and 3) to make statements or elicit reaction. Relevant for original illustrations, as well, and usually in keeping with the musical content and/or artist’s intent for the LP, or later CD. A number of others inspired by famous paintings for their sleeves, yet this particular jacket among the very few for reusing one. Franks’ preference for lyrically placing many songs in exotic venues, key. 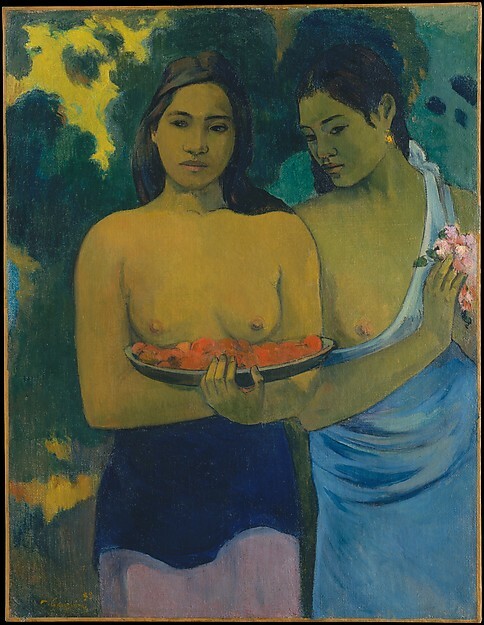 Art designer Simon Levy captured Michael’s predilection by casting Paul Gauguin’s2 “Two Tahitian Women” on the cover. Meaning to gather listeners’ awareness through another’s artistry with oil on canvas3; transfixing the vibe to a warmer, more passionate climate in the bargain. Although cropped to juxtapose its titles, the graphic buoyantly balanced one of Gauguin’s most famous last paintings vivifying serene Tahitian locale and beauty, with another’s intent seeking same via music. This is a great series of posts – thanks for sharing such insight – especially when it comes to classic music! I’ve only written about one Michael Franks album, and that was as part of a longer ‘memoir’ style piece way back in Vinyl Connection’s history. But like you, this is a favourite of the breathy old sensualist. Probably in my top three, along with the debut and Sleeping Gypsy. There’s such a lovely synchrony between the art and the music here. Nice one, Michael. I also love this theme, having posted several times in a series called ‘Art on your sleeve’ in which colleague and blogfriend JDB (Augenblick) writes insightfully about the art and I scribble some nonsense about the music. In fact, we have another in this very occasional series coming in the next few weeks. Just finished visiting those articles over at your blog, Bruce, and so glad you mentioned them. I look forward to another posting in the ‘Art on your sleeve’ series. You and JDB have a wonderful thing going and hope for many more to pour over. Oh, and the “…the breathy old sensualist”, is best description I’ve heard yet of Michael Franks. Delighted you enjoyed the posts, Michael. I got a real charge out of this post of yours – Franks is often dismissed in jazz circles, yet for fans his deft lyrics and polished arrangements (especially on those early albums) make him an enduring fave.